"The Zionist regime is a cancerous tumor and it will be removed," Teheran's Ayatollah Ali Khamenei said Friday. 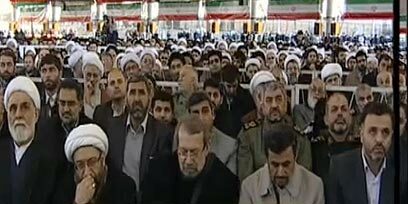 Khamenei addressed thousands of worshipers attending a Tehran University prayer service marking the Fajr celebration. The Iranian Revolution brought freedom and dignity to Iranian people and "destroyed the anti-Islamic regime, and brought Islamic regime instead… Dictatorship was changed to democracy," he said. Khamenei further downplayed the possibility of a United States' strike on the Islamic Republic's nuclear facilities: "A war would be 10-times deadlier for the Americans… These threats indicate America's weakness and the Americans need to know that the more threats they make, the more they damage themselves." He also dismissed the West's sanctions on Iran, saying that they will not make Iran forfeit its nuclear ambitions: "They said they would impose crippling sanctions to punish us, but the sanctions are good for us – they make us rely on our own talented people." He also reiterated Iran's threat to close the Strait of Hormuz, saying that "when the time comes we will execute our warning." Khamenei also addressed the Arab Spring, saying he believed the Palestinians will soon follow the example of the Arab world. He promised that "Iran would assist any country or organization that would fight the Zionist regime, which is now weaker than ever," he said. Khamenei, who has final say on all state matters, said that Iran has helped Hezbollah and the Palestinian Hamas in their fights against Israel. The crowd met the statement by chanting "Death to Israel." See all talkbacks "Khamenei: Zionist regime is a cancer"